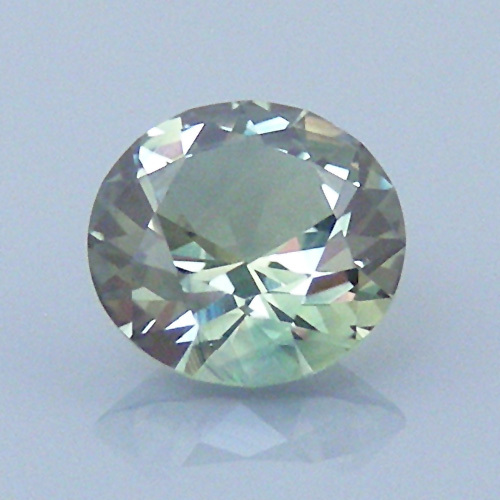 “Sapphire,” lime green with slight yellow and blue color, round brilliant cut, 0.92 cts, Nigeria. © Dan Stair Custom Gemstones. Used with permission. Note: This is a six-part edited version of Trevor Hannam’s Faceting Made Easy, a general introduction to faceting and a guide for learning to cut a standard brilliant gem. Part 1 covers the Introduction and Chapters 1 and 13. These chapters review gemstone properties as they relate to gem cutting. The International Gem Society thanks Mr. Hannam for permission to post his work. Have you ever read a book filled with so much technical jargon that it leaves you more confused than when you started? I think we’ve all experienced this at one time or another. Personally, I find learning from such books, without proper illustrations or explanations in everyday terms, very frustrating and discouraging. Unless beginners can get instructors to help, most will just give up. That’s why I’ve written this book. Faceting Made Easy and the associated video contain detailed instructions and illustrations for cutting the standard brilliant. Readers will also gain a working knowledge of all parts of a faceting machine. Faceting books and teachers often vary in their techniques. Most still advocate cutting the table first. However, times change, and new ways to cut a standard brilliant emerge. 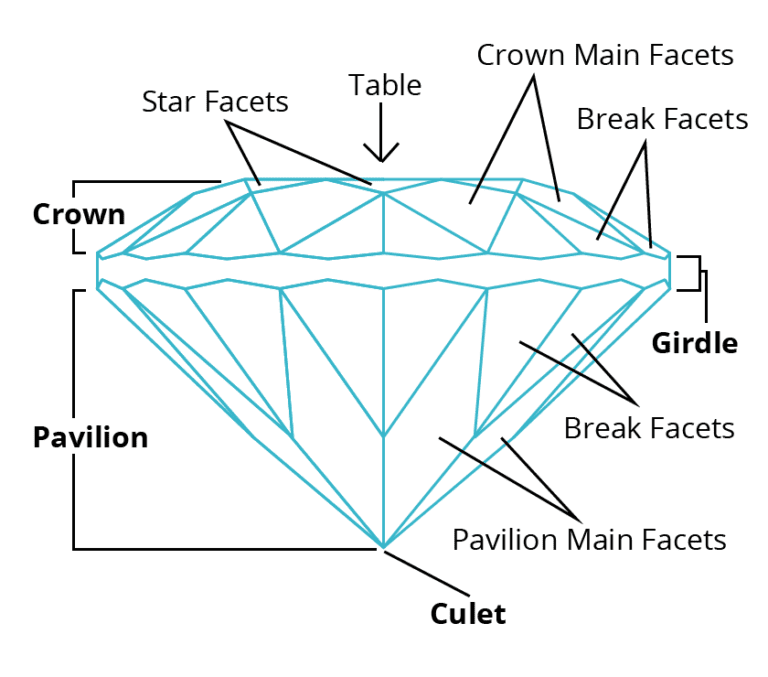 This book just presents another way of faceting, starting with the pavilion. As you read and learn, you’ll see the wisdom of this technique. There are no hard and fast rules to faceting, just the basics. I encourage beginners to experiment once they’ve mastered the standard brilliant. I feel this book presents gem faceting in a manner that anyone can learn quickly. Soon, they’ll be developing their own techniques for the art of gem cutting. Light travels through the vacuum of space at 299,792 kilometers per second. As it passes through air or a solid object, such as a piece of glass, it does two things: it slows down and changes direction or bends. Why does light slow down? Because it passes through denser material. For example, try driving a car through water. Since water is denser than air, it slows us down. Why does light bend? As light passes through glass, for example, the sudden reduction of speed pulls it due to the higher density. Let’s go back to our driving example. We’re driving on a sealed road. Up ahead, we see a small amount of water on the left hand side of the road. As we hit this water at normal speed, the vehicle is immediately slowed down and pulled to the left. This is exactly what happens when light passes through glass. This phenomenon is known as refraction and occurs when light passes through all gemstones. 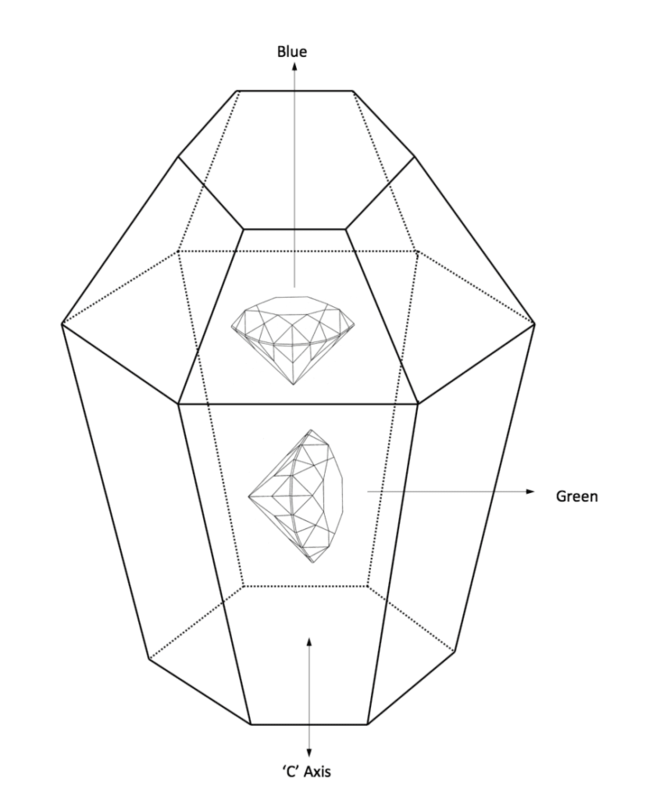 A gem’s refractive index (RI) is the speed of light divided by the speed of light though the gem. In some minerals, such as calcite, light entering crystals splits into two paths. This is known as double refraction. Minerals can be either singly refractive or doubly refractive. In singly refractive minerals, light slows downs, refracts, and reflects internally. 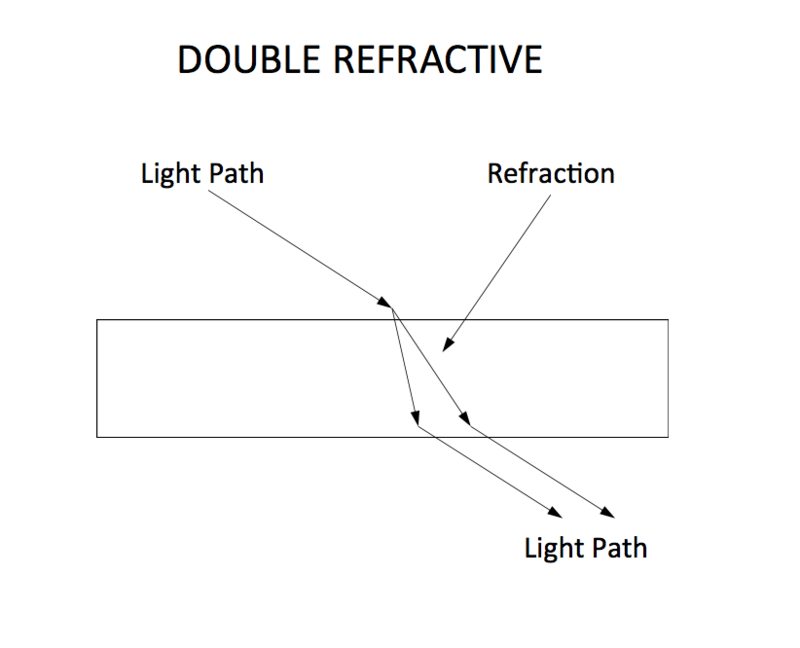 In doubly refractive materials, this process differs. Light splits into two paths due to the mineral’s atomic structure and its two crystal axes of different lengths. You can see the effects of double refraction very well by examining calcite. 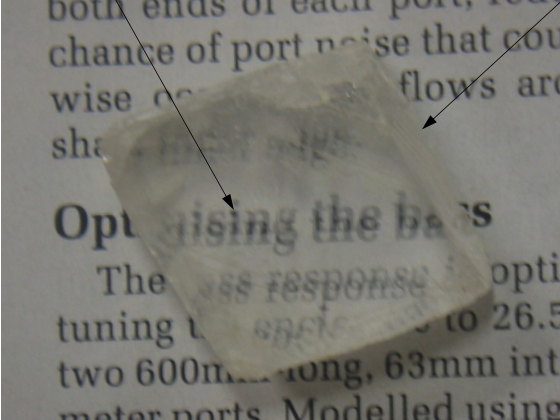 If you place a piece of clear calcite over some small print, you’ll clearly see the print doubled. 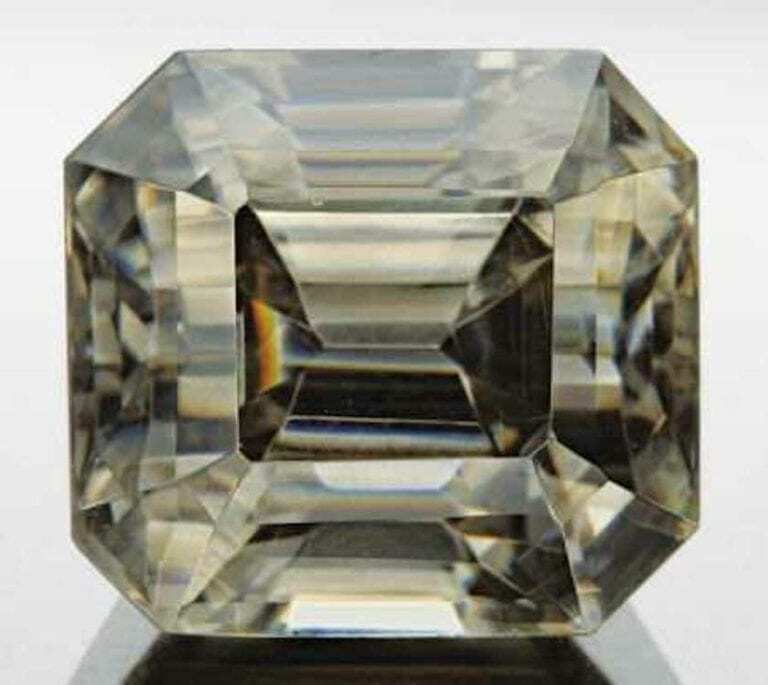 When cut at the proper angles, a gem will reflect light internally many times. Then, it will return the light through its table to the viewer’s eyes. This internal reflection and refraction produces little explosions of color. The facets actually act like tiny prisms. If passed through a prism, white light breaks down readily into the colors of a rainbow. As a kid, I learned to remember this as a name: “Roy G. Biv.” Red, Orange, Yellow, Green, Blue, Indigo and Violet. This phenomenon is known as dispersion. You can easily identify doubly refractive minerals by using a polariscope. Amateur faceters definitely need this instrument. A polariscope consists of two discs of polarized plastic separated by a mechanical support. A light source is placed underneath one of the discs. Then, the gem is placed atop this disc, while you look through the top disc. Next, turn the top disc until it reaches its darkest point. 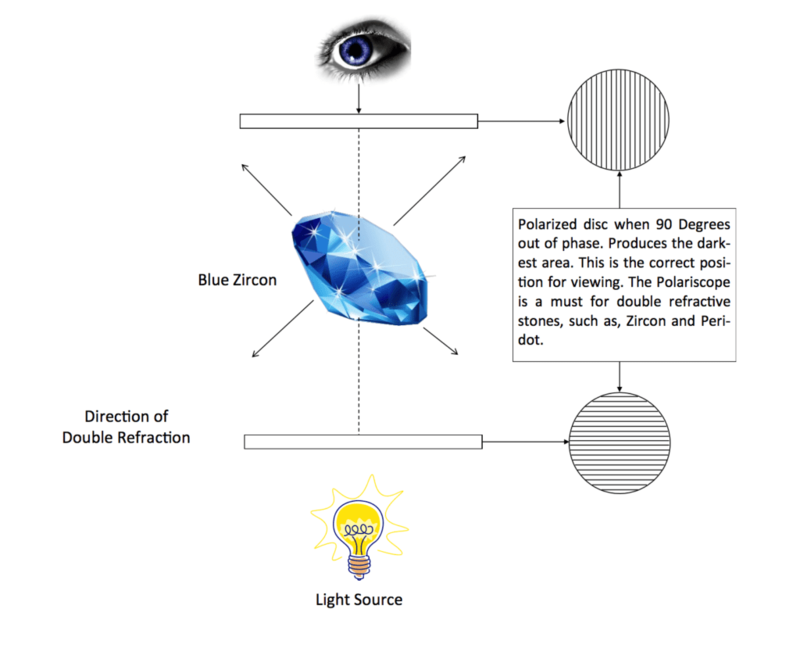 Now, turn or rotate the gemstone in a 360° revolution in all directions until you see the best position of refraction. 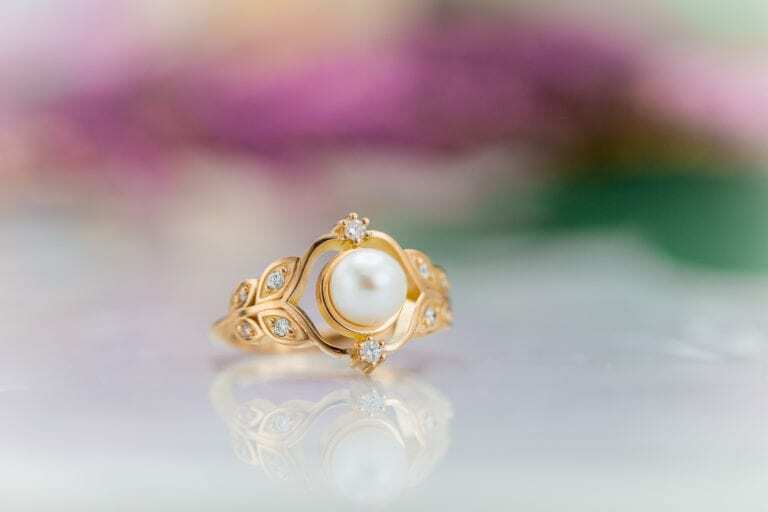 With a doubly refractive gem, what you’ll see as the gem is turned is a change from lightness to darkness of the polarized light. For uniaxial doubly refractive gems, you’ll see this two times. For biaxial doubly refractive gems, you’ll see this four times. The axis of the gemstone or rough is the part where the gem turns the least amount of light and dark. The illustration below shows how a polariscope works. 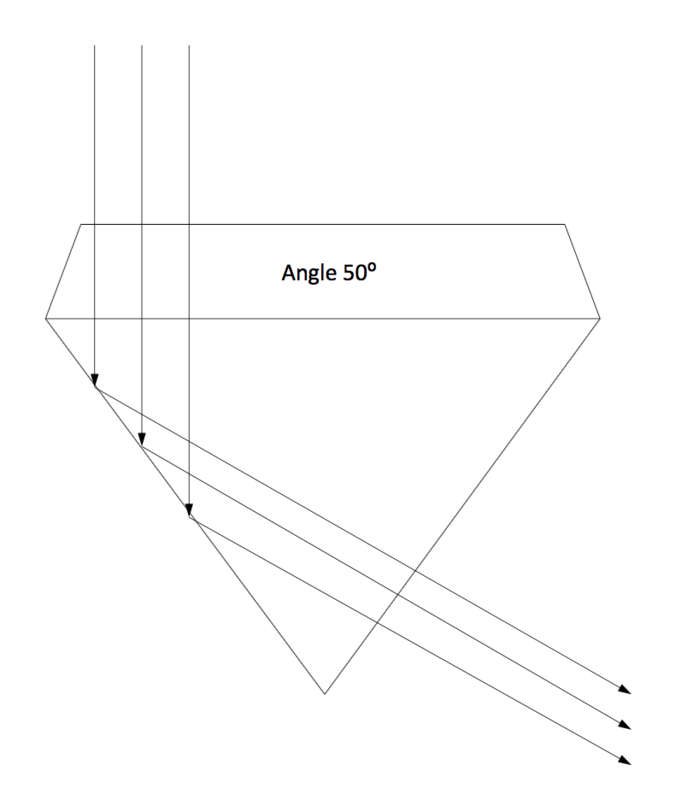 As the angle of light from a source to the surface of a gemstone increases, the angle of refraction will also increase, until a point is reached where the light will run parallel with the surface of the gemstone. The angle of incidence which causes the light to become parallel to the surface is known as the critical angle. 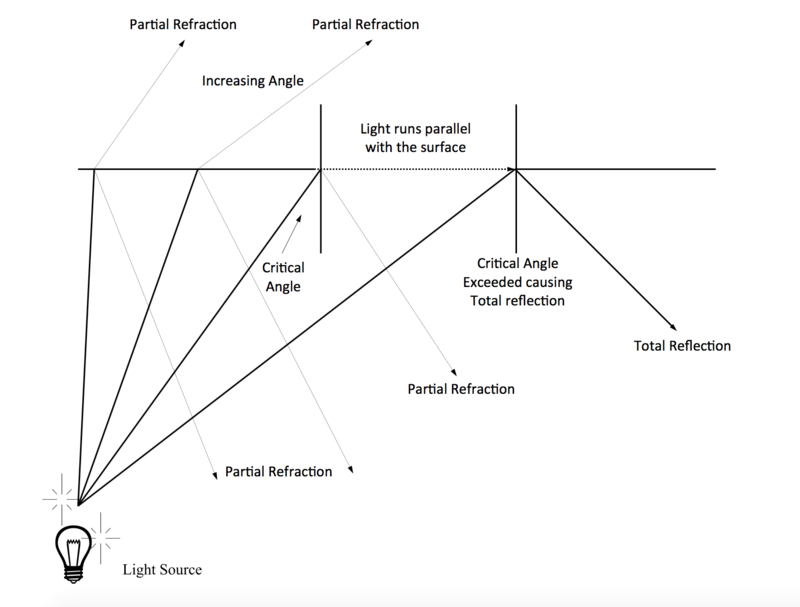 If the angle of light exceeds the critical angle, the light source will become totally reflected. 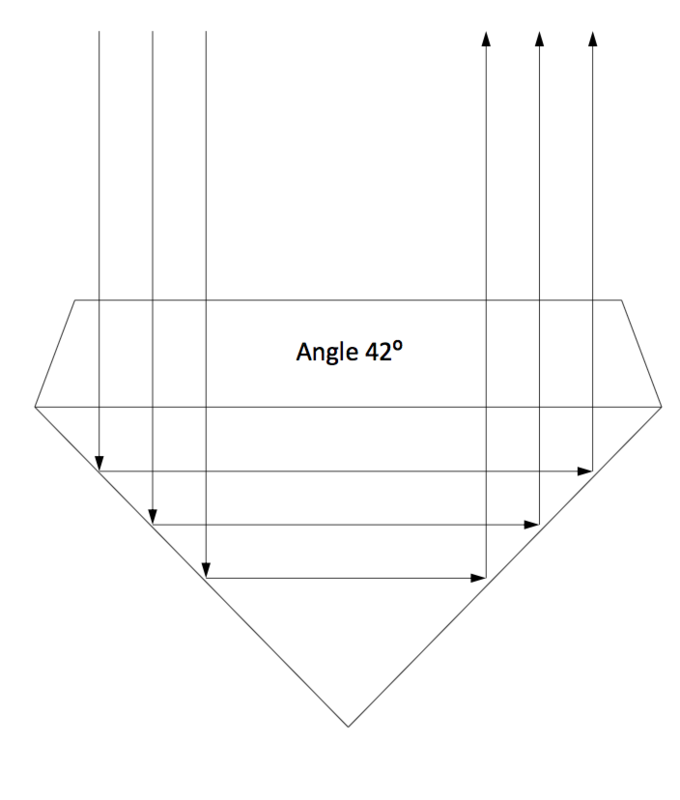 Minerals with a small critical angle will lose less light than those with a larger critical angle. Thus, gems with a smaller critical angle can prolong the internal reflection of light, producing more sparkle and color. 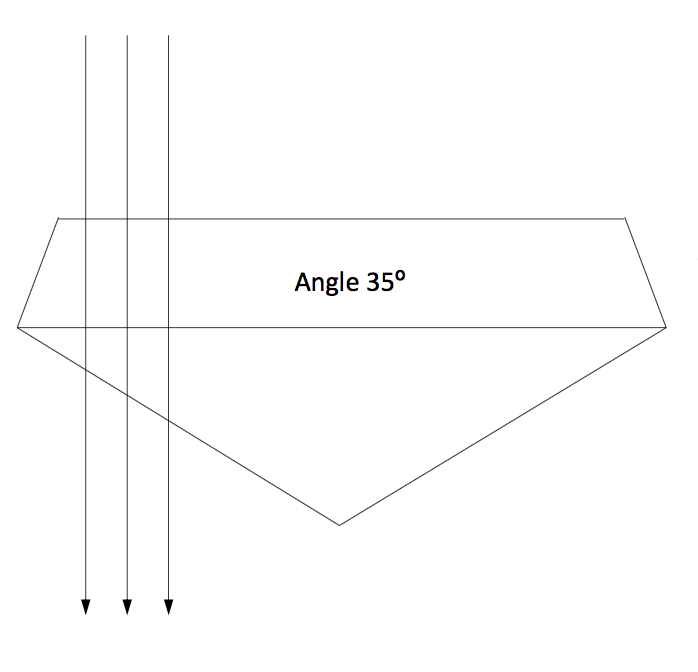 Let’s take a topaz, which has a critical angle of 37°, cut from 39° to 42°. This gem has been cut correctly. The angles are correct for topaz. It has full, total reflection, which produces those little explosions of color. This gemstone has a dark center, caused by excessive leakage of light through the pavilion. This is due to the fact that it was cut at an excessive angle of 50°. This gemstone has a “fish eye” effect. You can see straight through the center of the gem, and a halo appears around the perimeter. Cutting the stone far too shallow, 35°, caused this effect. Certain minerals show different colors, caused by absorption, when light passes through different directions in the stone. 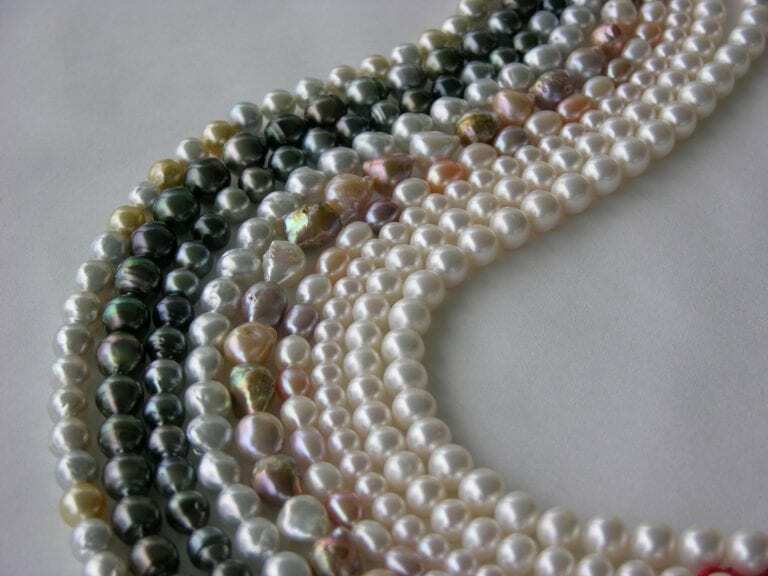 If you turn a gem and see different colors from different directions, the mineral is referred to as pleochroic. For example, if you look straight down a sapphire crystal, along its C axis, the gem may appear blue. However, if you look at it side on, at 90°, the same crystal may appear green. Gems that show two such colors are called dichroic. 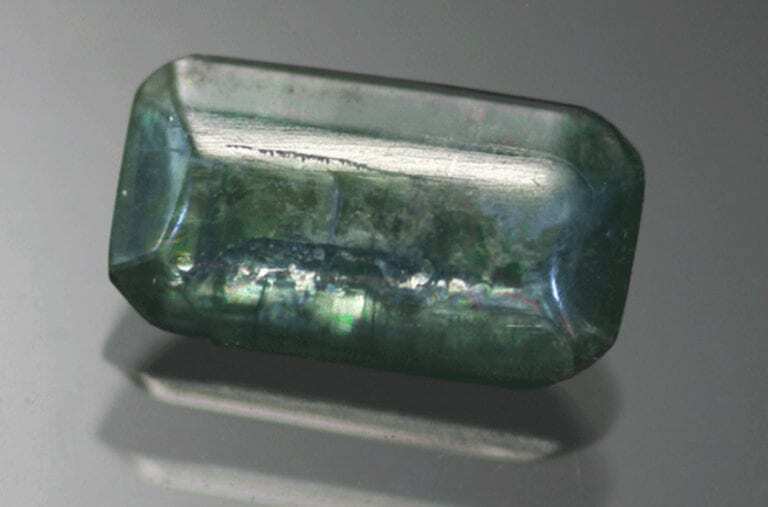 The gem iolite also shows this phenomenon but can show three colors: blue, clear, and yellowish. Such stones are called trichroic. You can use an instrument called a dichroscope for viewing this effect. It’s made from a piece of clear calcite and a lens situated in a small tube. Born in Wudinna, South Australia, Trevor G. Hannam moved to Cairns, Queensland in 1966. 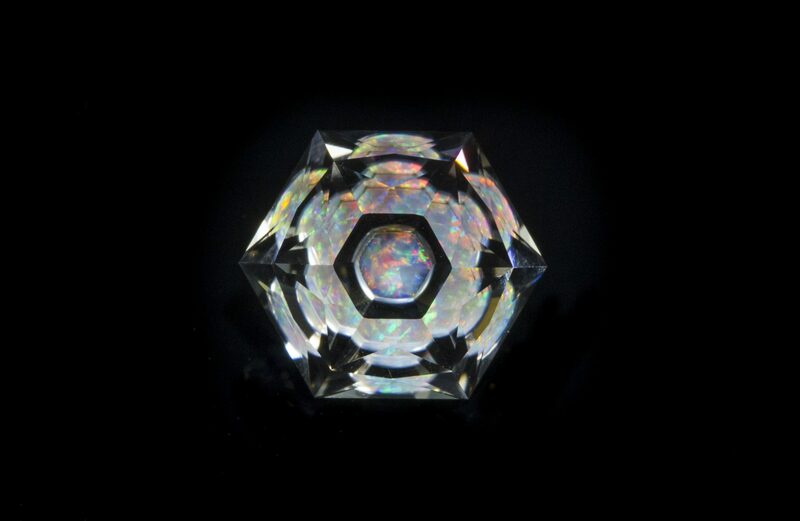 Introduced to faceting by Kay and Jimmy Gadd, he learned to facet with the help of Bob Johnson. After completing a diploma in Earth Science, he continued to study the art of gemology through Kye Jewellers. 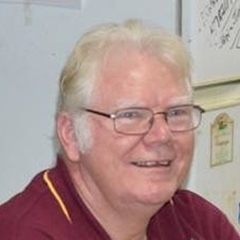 Currently retired, as a member of the Cairns Mineral and Lapidary Club, he taught the art of silver smithing, gemology techniques, and faceting. Advance your knowledge of gemology with the IGS Certification Course! A glossary of frequently encountered faceting terms for the student gemologist. Our list covers gemology, gem cutting, and equipment.